Method: In vitro assay for inhibition of α-amylase, α-glucosidase and DPP-IV was carried out using black carrot purified extract and the standard inhibitor acarbose and vildagliptin, recpectively. The inhibition activity of selected phenolic compounds was also studied by in silico docking with all these three enzymes for the proper understanding of interactions. Encapsulation of purified black carrot extract was also carried out. Results: In vitro IC50 value of purified extract was found to be better than the standard inhibitor acarbose for α-amylase and α-glucosidase, and vildagliptin for DPP-IV. Similarly, docking scores of few anthocyanin molecules were found to be higher than their respective inhibitors, suggesting more effective inhibition. Among anthocyanin molecules of black carrot, cyanidin 3-xylosyl galactoside was found to be the potential drug to inhibit these enzymes, whereas dipeptidyl peptidase IV was identified as the best target to control diabetes with anthocyanins of black carrot. 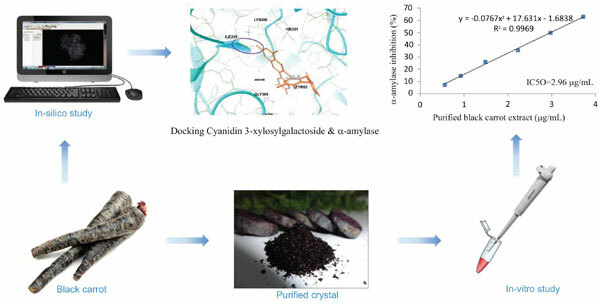 Conclusion: Anthocyanins from black carrot were found to be effective to control diabetes and very first time we propose that cyanidin 3-xylosyl galactoside is the best potential molecule for inhibiting enzymes involved in glucose metabolism. The study also shows the encapsulation of anthocyanin compounds using β-cyclodextrin. Black carrot, anthocyanins, diabetes, autodock vina, α-amylase, α-glucosidase, dipeptidyl peptidase IV.